Letter sent from Liverpool on board Cunard's "Hibernia" deparing 19th September and arriving at Boston on 3rd October 1846. 'PAID AT / LIVERPOOL' mark: Robertson / Tabeart type M3, in use at Liverpool 1840-1853. The GB packet fee of 1/- for the first half ounce was introduced 10th January 1840. The 1/- handstamp was issued in 1840 for the Cunard service and developed into many forms, described by Tabeart as the 'squiggle', Robertson type M67. 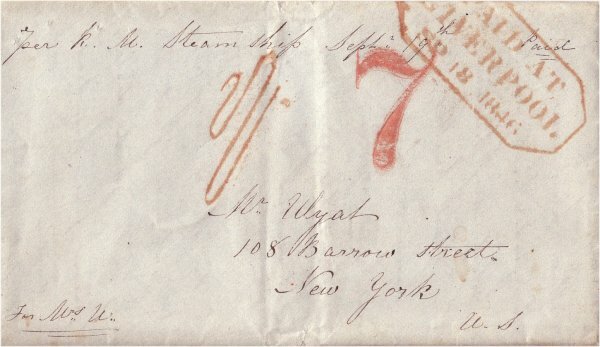 The US ship fee and inland charge applied to Cunard mail until the 1848 Anglo-American Treaty. The New York mail was bagged at Liverpool and not opened until it reached New York. This speeded handling at Boston, where a train awaited the incoming Cunard ship.